Looking for a spooky snack for Halloween or just to be a little creepy crawly? 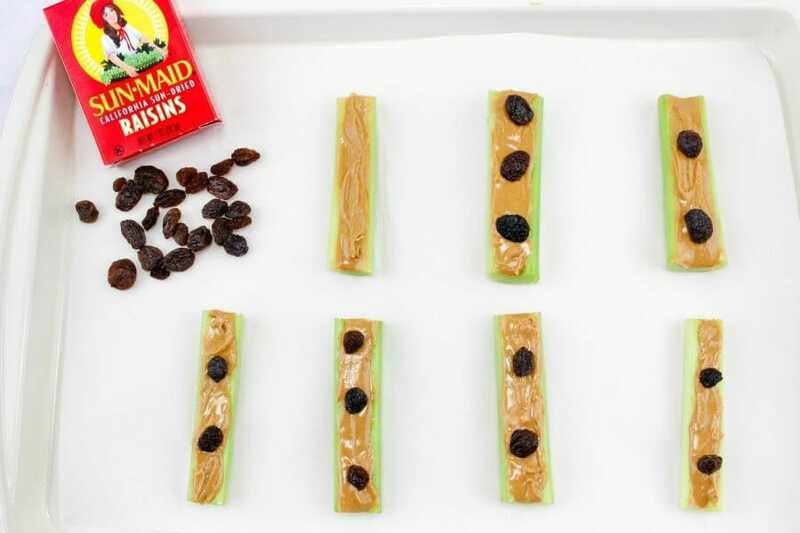 This idea is kind of like the classic peanut butter and celery snack “Ants On A Log” with a silly twist. This is a great Halloween snack for a party, but is also fun to surprise the kids with a treat after school or in their lunchbox. Does your family get scary or silly for Halloween? I’d like to think in our house it’s a little bit of both, and it totally shines through into snacks and meals. Not every meal is spooky, but I do like to add a few fun food touches as my kid always laughs when I do. We also always seem to have at least one Halloween party to go to where I’m bringing a snack or treat. 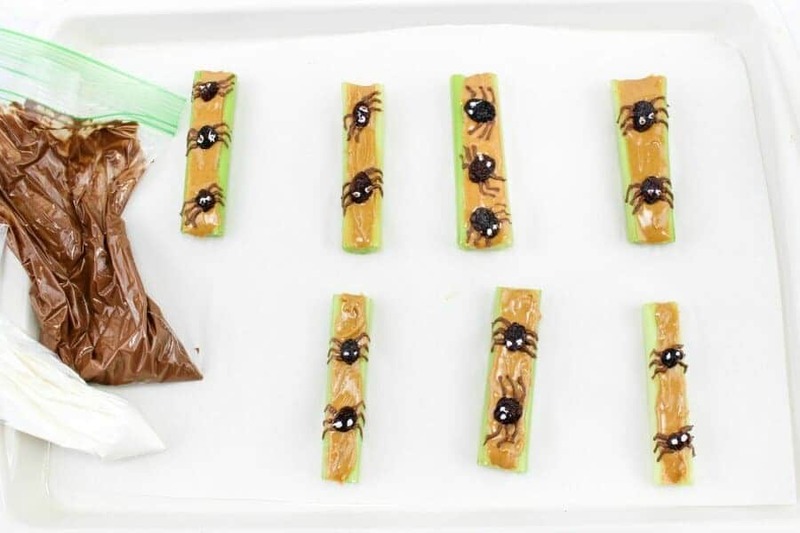 These peanut butter spiders “on a log” are a great idea for a Halloween party. Little kids and big kids will enjoy them plus it has a familiarity that always makes them go super fast. 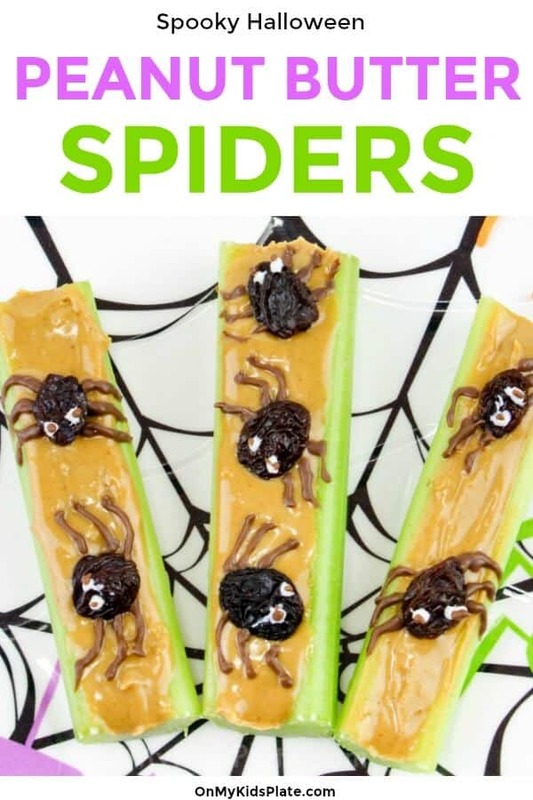 A platter of these spider Halloween snacks always looks super impressive and doesn’t take very long to make at all. You can also prep this snack ahead of time for the party. They also work great for a lunchbox. I think my favorite part is it feels like a sweet treat without being super sweet. Candy is everywhere at Halloween and while I love me some peanut butter cups (can’t stop, won’t stop! ), this snack is a little less decadent without losing the fun. It’s a great one to give to the kids before trick or treating as part of dinner, with plenty of protein that will help keep their little tummies from exploding from all the treats. Maybe, I can’t make any guarantees, it is Trick or Treat after all. Sometimes you just can’t help yourself, but we can try right? Slice up some celery and give the peanut butter a nice spread on evenly on all the slices. Next, add the raisins. This all feels familiar right? I like to have my kid help add the raisins. Now that she is a little older, she can spread peanut butter too. Melting chocolate can be tricky the first time you use it if you are not familiar. If you get any liquid into the chocolate it will seize. This is not the time to lick the spoon and put it back in the chocolate. I use half power on my microwave to melt chocolate in short intervals and stir in between. It doesn’t take very long before the chocolate melts. Spoon the chocolate into a plastic sandwich bag and snip a very tiny hole off the corner. Use this to make the spider snack’s eyes and legs. If you find the lines are too thick, you can also use a toothpick dipped in the melted chocolate melts (one for each color melt) to make the legs and eyes. Adorable! 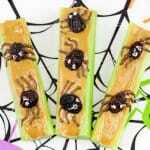 It’s totally possible to make this little spider snack peanut or allergy-friendly depending on the crowd at your Halloween party. 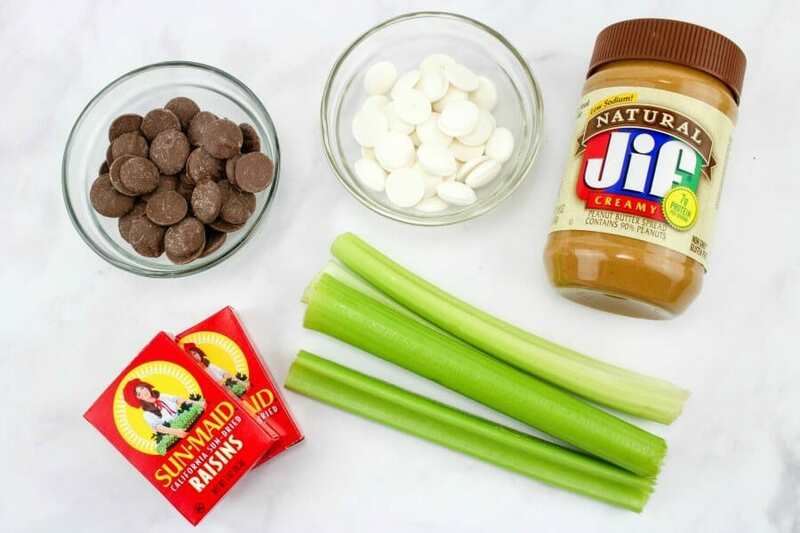 Here are a few substitution ideas you may want to try in this snack. Use cream cheese in place of peanut butter- a flavored cream cheese might be even better with the chocolate! Consider the eyeballs optional, the legs are the super spooky part! This super easy spider Halloween snack has peanut butter, celery and a side of spooky perfect for the kids. Sweet, salty, and overall healthy your kids will love this snack after school, at a Halloween party or in their lunchbox. 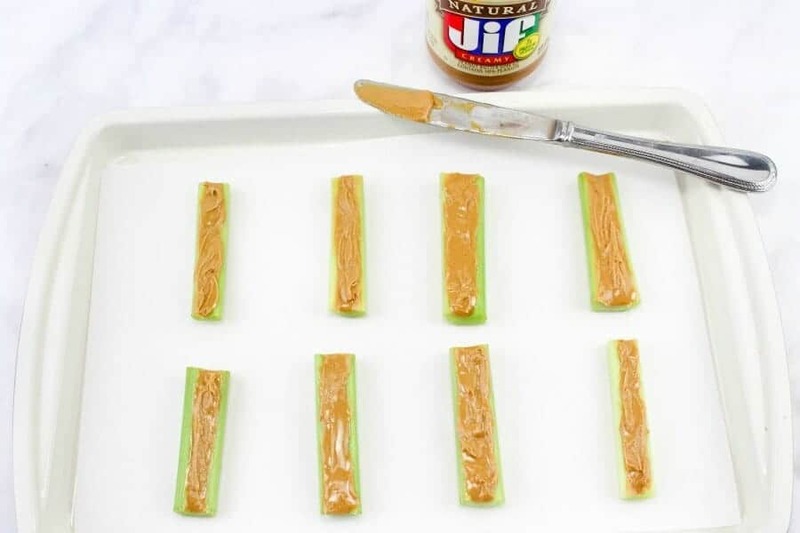 Spread the peanut butter onto each celery stick. Place 2-3 raisins on each piece of celery. Melt candy melts in a small bowl in the microwave on half power, in 20-30 second intervals stirring in between. Spoon each melted chocolate into a sandwich size baggie and snip the corner very very little. With the milk chocolate, draw on 3-4 legs on each side of the raisins. Then place 2 dots of white chocolate on the raisin for the eyes. Enjoy this fun spider Halloween treat! A toothpick can also be dipped into the melted chocolate and used to draw the legs and eyes. Melting chocolates are usually found in the cake decorating section of stores like Michaels but can be also found in some grocery stores. So there you go, a Halloween spider snack perfect for your next party, lunchbox or just for fun before trick or treating. Totally spooky snack, but not creepy for sure! Need more ideas? Check out my Halloween Ghost Eggs! Need more ideas? 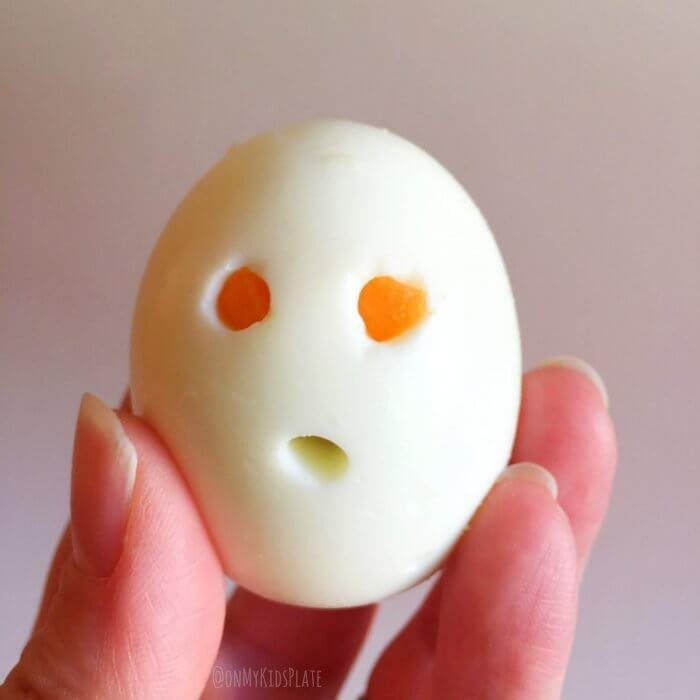 Check out these creepy Halloween Ghost Eggs!